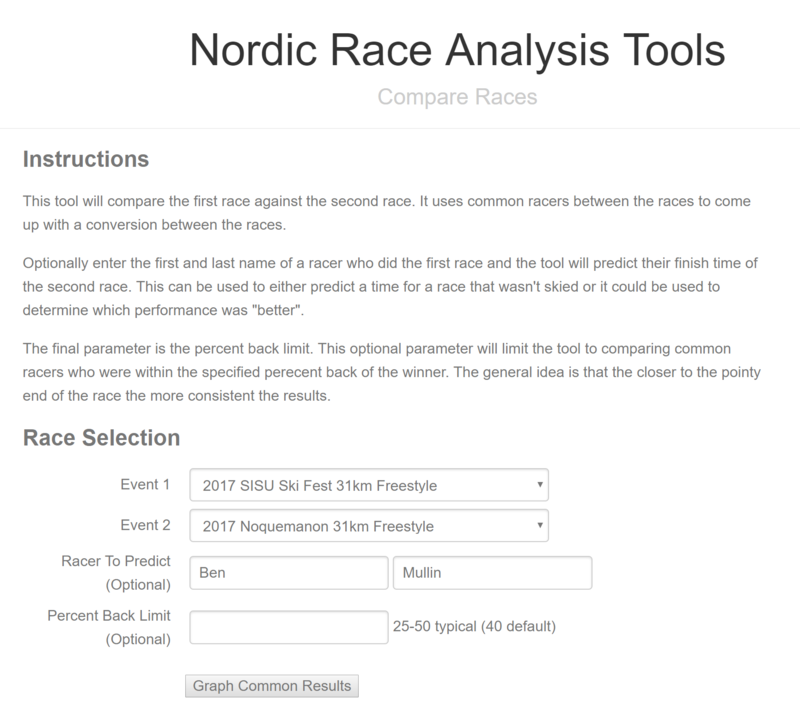 This is a collection of tools for viewing, reviewing, and analyzing race results from predominantly Midwest citizen nordic races. 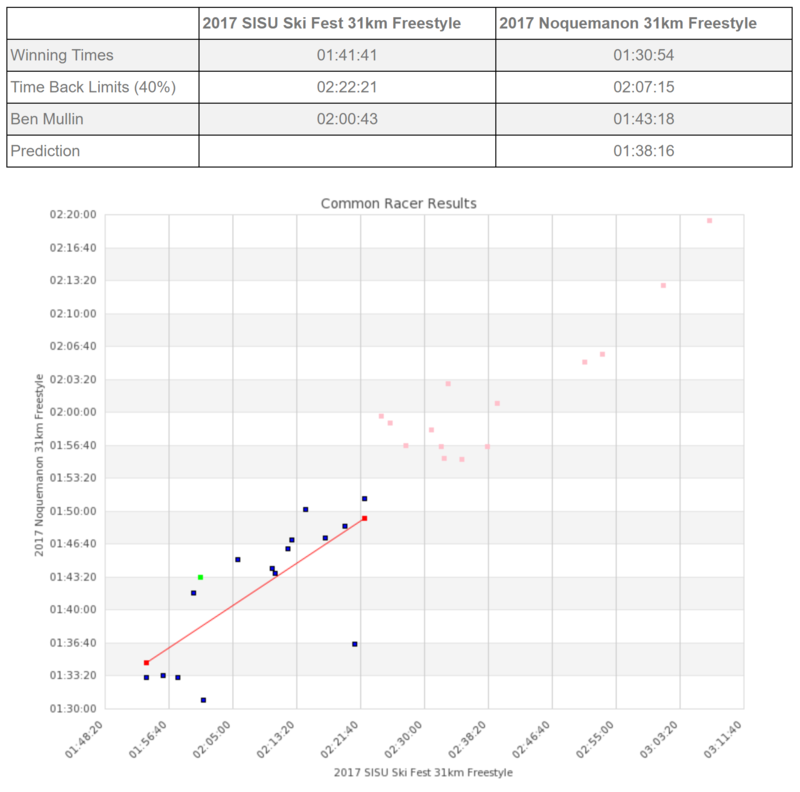 This uses the race comparison tool to review your past two years of results against the most recent Birkie ('16 unfortunately). 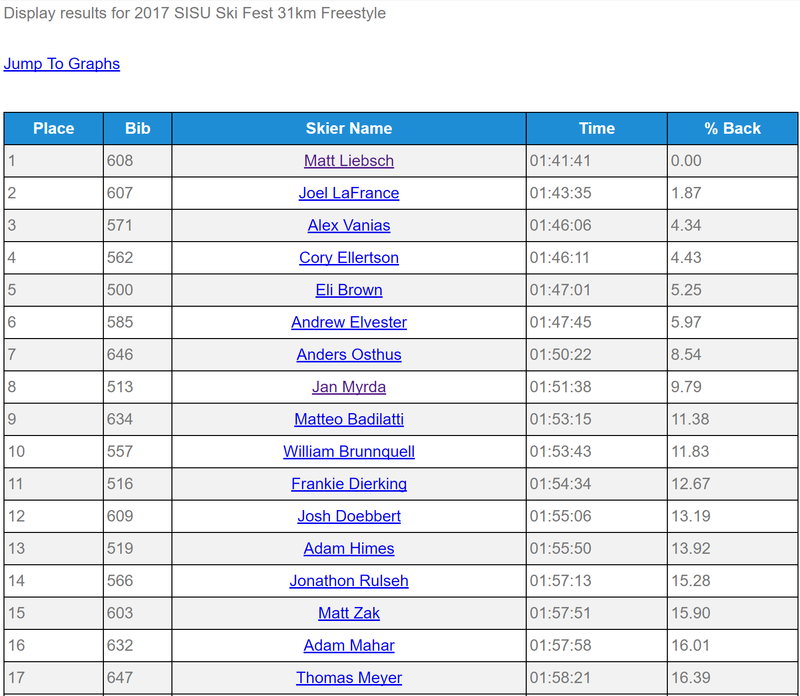 There are two routes to take, if you are interested in a particular skier, select either the Birkie Predictor or View Skier Results menu items from the left. From there you can select the skier of interest and start exploring the data. The second option is to find the results from a particular race to dig into. 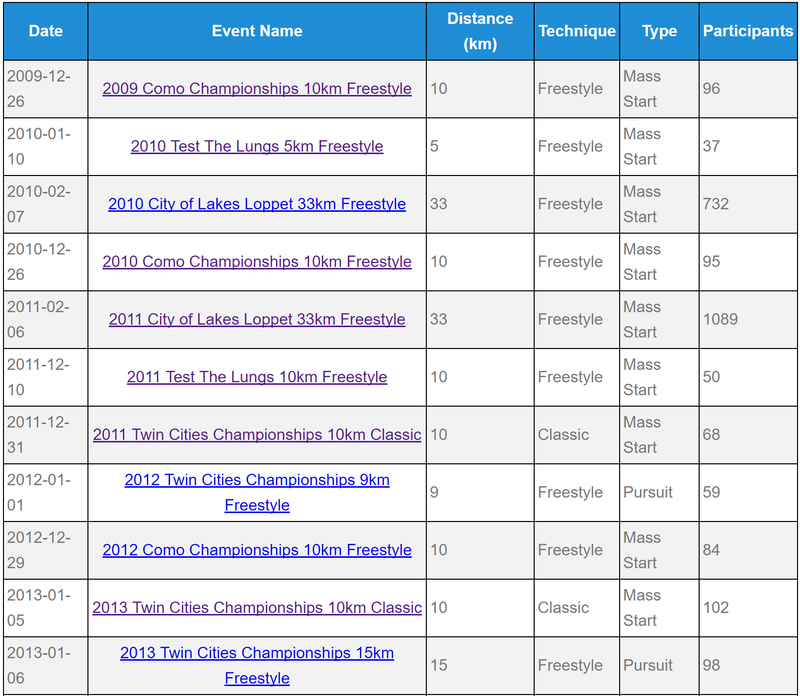 Either select View All Events to see the full database or View Event Results to select a race from a list. Any of these options will get you started and you can navigate around from there. From an event you can select a racer in the results and vice versa. There isn't any magic in those tools though. The race comparison is where either the magic, or BS, happens depending on your point of view. For this you select two races and optionally a racer to compare. The tool then will identify racers who did both races and build a mathematical model to compare the two races. 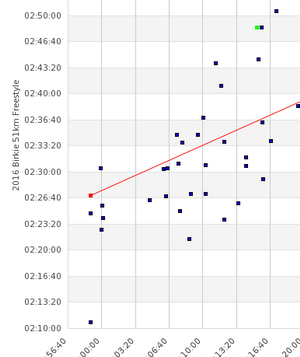 If the selected racer did the first race the tool will predict their anticipated finish time in the second. Use this tool to make an educated guess of how you would have done at a race you didn't attend, or to compare your performance at one race against another (was the predicted time or actual time faster). Basically what you have here are a set of tools I had built for myself over the last few years to do some post race analysis. Things like trying to get a handle on if I was getting better, was a given race better than another one, how might I have done had I showed up to that race I didn't do, etc. 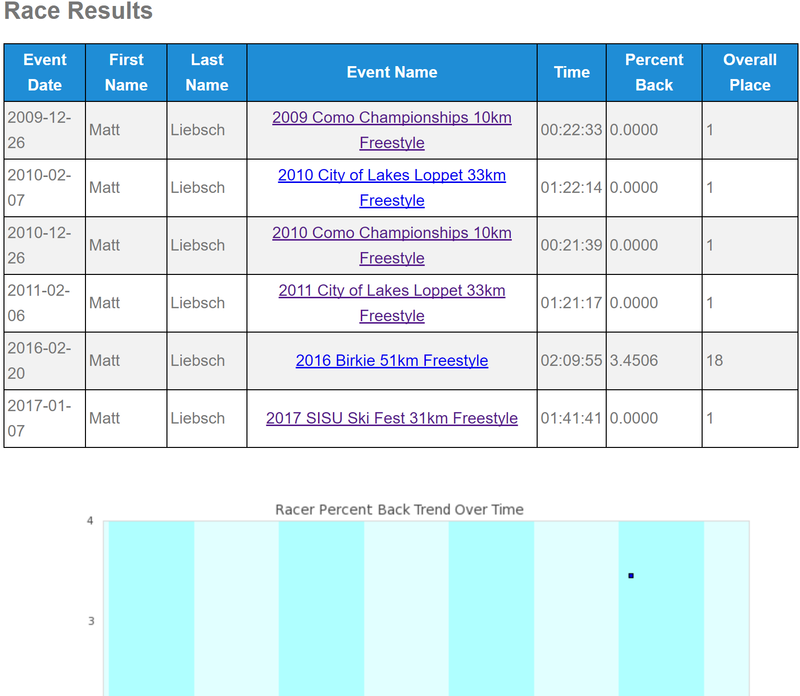 It started with an Excel spreadsheet and some VB macros based on my understanding of how the City of Lakes Loppet did wave placement for folks who hadn't done their race previously. Over a few years I collected a bunch of race results and was able compare my race results from year to year beyond just a time which is pretty meaningless and placing which is slightly less meaningless. Now I've migrated them to be web based tools. As an embedded sw engineer by training, the web based stuff was a bit of a stretch. It certainly should make a true web developer or db admin cringe. Do I Need These Tools? Quite frankly you don't. But what else are you going to do when you aren't racing, training, or waxing your skis? This is really just a pet project of mine that keeps me out of trouble when I'm not out doing something more active. These results have all be extracted from publicly available sources, but should not be considered official, or officially endorsed by any race promoter in anyway.